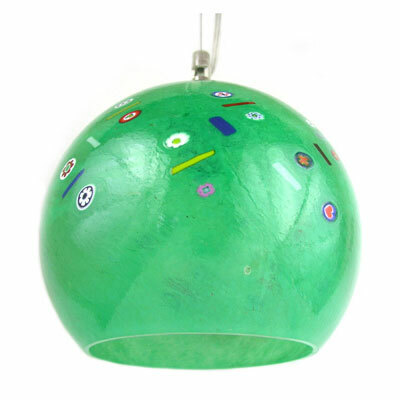 Handmade, dome-shaped Venetian glass hanging lamp with a subtly textured surface combined with slices of millefiori cane. The shade measures 6 inches tall by 8 inches in diameter. Complete with a 42 inch adjustable, braided cable. Takes one chandelier-style bulb of up to 60 Watts. Available in yellow, green (shown), blue, and red.